This Samaritan woman Jesus teaches in John 4 is an interesting person. She had had five husbands and was living with another man. It is a little too much to assume that all five of her husbands died, so we must assume chronic divorce. This means that she had a very broken home, and it is easy to understand that she may have lost faith in marriage as an institution by then. Yet she must have been an attractive and charming woman, since four men wanted to marry her after her first husband ended it, and another man was willing to live with her outside of marriage. But, too, she must have also been a strong-willed, contentious, and antagonistic woman, with five marriages ended. We can see a little of this in the beginning of her conversation with Jesus. He just asks her for a drink and she jumps all over him. “Why are you talking to me?” She challenges Him, and you can see she thinks He’s a bit of an upstart who needs to be taken down a peg or two, especially when He says He could give her living water. She tests Him. Her question "Are you greater than our father Jacob who gave us this well...?" is a demeaning attack meant to wound the male need for respect and could have unconsciously pained Jesus's sense of divine identity. It is admirable that Jesus never gets irritated, but answers patiently, inviting her to receive the gift of living water. Then His sudden statement about her married life is so startling and unexpected; how could anyone have guessed such a home life as hers from her simple sentence “I have no husband”? I really think the way he reveals this is meant to give her a taste of the living water of prophecy and discernment that was accessible to Him and which could be given to her. It was also a sign to her that He really did know who He was dealing with and what kind of problems festered in her life. When He reveals His knowledge of her, she gains more respect for Him, but she still questions Him, going to the root of the age-old controversy between Jew and Samaritan over where the best place to worship was: is it Jerusalem or Mount Gerizim? She wants answers, and she’s not afraid to bring up a thorny divisive topic to get them. After all this, it is notable that when the woman goes back to the town to spread the news about Jesus, she goes to the men not the women. (She was probably persona non grata among the women.) It indicates not only her influence among the men, but also their humility to listen to her and go see Jesus. Or maybe she was a tough enough woman to deal with that any positive change in her was a ringing endorsement for Jesus. Regardless, I like that she was such an enthusiastic missionary. There’s no telling how far she was in the conversion process, but she had to share it! I also like that she was skeptical at first and challenging; it indicates how no-nonsense she was. She’d been around the block a few times, she’d heard some fair promises in her day that hadn’t been kept, and she was going to get to the bottom of any fakery. No pie-in-the-sky mysticism would satisfy her. She had harsh realities to deal with and suffer through. Nothing less than total transformation could help her. Why spend this time examining the character of the Samaritan woman at the well? I think it gives us a better picture of the spiritual power and love that Jesus had that He was able to reach someone in such a difficult life situation. This story tells us that Jesus’s message isn’t just for those of us who have stable marriages and happy families; His message is also for those of us who are having terrible family problems and who are trapped in destructive patterns of relating to each other. When there is no peace at home, the peace of the gospel has a very big void to fill. But it CAN fill it. That promise of the living water is for all of us. I think it's important that he taught the principle of living water to someone who had had a hard life and made some bad choices. So often it's easy to tell ourselves 'that doesn't apply to me' because we feel like our life is too hard, or because we've done something too awful. The fact that he taught this to someone like her gives us all more hope in his promise. Thanks for sharing, I thought about her and your post for a good long while. I love this. I had never thouht of her as being fiesty, but you are right she really was. It is always so enlightening to me to take a closer look at people's characteristics, it helps the scriptures become more real to me. I am so glad that you have written about the woman at the well. She is pretty sassy isn’t she? Or maybe she was a devout person who was defending what she knew about her beliefs. I was watching a program that talked about the “tradition” of women coming to the well of Jacob" to look for a husband.The women would come and look for a husband, loosely in the tradition of Rebekah when she met the servant of Abraham at that well. 18 so she said, “Drink, my lord.” Then she quickly let her pitcher down to her hand, and gave him a drink. Is it possible that she was an honorable woman or widow, maybe a young widow fallen on desparate times. You can find background info about her condition in the book of Jeremiah. Many young women were widows. The tradition is to marry a surviving brother or kinsman (as in Ruth) and raise up seed to the original dead husband. (Maybe that's why so many husbands).The conversation is quite modern, and at first glance, Jesus must have seemed like quite a catch for her. But then when he spoke, how did she know he was a Jew? Was it his accent or his dress? Her response “Why would you ask me for water?” seemed to imply that she thought he could be a man playing into the tradition of one who is looking for a wife. 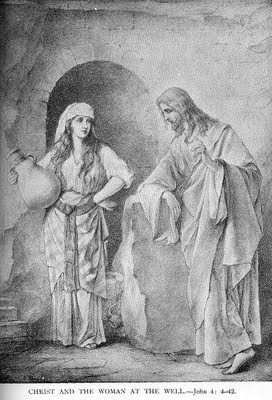 But then, she saw also that Jesus did not have anything to offer her, no obvious wealth around him, camels, servants, etc. He didn’t even have his own bucket for water. I believe that this woman was seeking, she was similar to a few other women whom Jesus would meet, such as the woman who was taken in adultery, the woman who seemingly came out of nowhere, and started to weep and wash his feet with her tears. He had compassion on these women. He knew what their struggles and problems were. In Luke 4:18-20 He proclaimed his message, he was anointed to preach the gospel to the poor, he was sent to heal the brokenhearted; etc. Her questions remind me of my own questions as an investigator of the Church of JC of LDS. Matthew 5:6 Blessed are those who hunger and thirst for righteousness,for they shall be filled. This woman’s situation certainly was dire, maybe even hopeless if she was continually searching for that “man of God” who would save her. But then, she found him, I am sure that there is a terrific back story. They stayed in that place for 2 days, and she had to be baptized. RGG, fascinating perspective. There are all kinds of interesting factors that could be at play in this story. Thanks for sharing your thoughts. How does the Lord make Nephi’s words strong?